This recipe makes 1 gallon and it takes about three weeks to complete. 3 inches or more of fresh ginger root with the skin. 2 cups of raw sugar. 1. make your Ginger Bug ( lacto fermented ginger) 2 to 3 days. 2. Make your ginger beer mix this takes about 1 hour. 3. Bottle your ginger beer and wait for 2 weeks. First, make your ginger bug by adding 2 teaspoons of grated fresh ginger ( leave the skin on) and 2 teaspoons of raw sugar mixed with a cup of water. Leave the mixture in a warm place and cover it with a cheese cloth to keep the flies out. Each day you will repeat this process by adding 2 teaspoons of sugar and 2 teaspoons of ginger to the same mixture until it starts to bubble (usually after 2 or 3 days). add 2 to 6 inches of grated ginger and 1-1/2 cups of raw sugar to 2 quarts of boiling water. Boil this mixture for 15 minutes then let it cool down. Add 2 lemons and your ginger bug to the beer mix (make you strain the ginger bug first). Now, add enough water to make one gallon of liquid. Step 3. 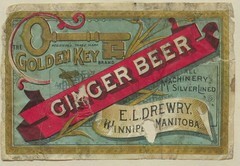 Bottling your ginger beer. Ther are two types of bottles you can use EZ cap bottles with gaskets and standard bottles with press on caps. If you are using bottle caps you will need caps, new or recycled bottles and a bottle cap press. Be sure to clean and sanitize your bottles first by boiling them in water. Place your ginger beer mixture into your bottles then let them set for two weeks in a warm place to ferment. When your ready to drink fresh fermeted ginger beer just place them in ice of in the fridge to cool down then pop the cap and enjoy.